Every year, for as long as I can remember, the Soil Conservation District in my area has hosted a spring tree sale. Nowadays the soil part of their name is gone and are now known as the Conservation District because they are involved in so much more than controlling soil erosion. Nearly every county in Michigan has its own Conservation District and just about every district holds some kind of plant sale. The plant selections may vary slightly from district to district but they all offer plants used for conserving soil and encouraging wildlife. Tree sales are a major source of funds that go toward conservation projects in the local districts. To find a Conservation District in Michigan, click on this link. Do it soon because plants often sell out early. Head researcher, Dr. Fred Kim, said: ” Nearly everyone I know already has some kind of fungus growing in their refrigerator. Our research team decided to take advantage of that fact”. The new variety called ” Shrooms” uses any leftover food as a substrate to grow on. 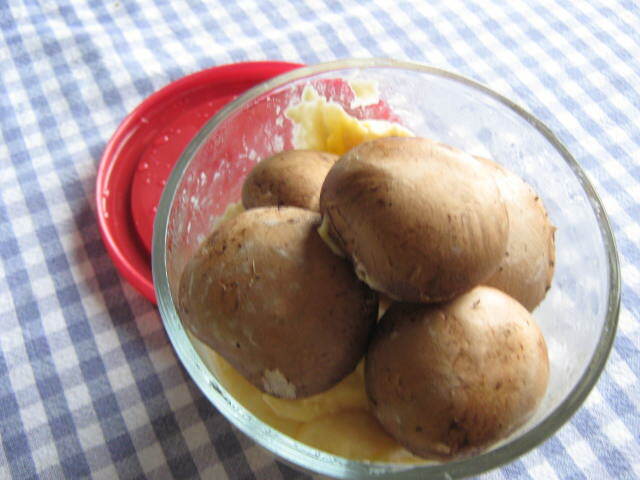 Dr. Kim noted: “The older and more forgotten the leftovers are, the better the mushrooms grow”. I grew my shrooms on what I think is leftover mashed potatoes. Walter Tupper, the Executive Chef at Top O’ the Cave Restraint in Grosse Point Farms, Michigan, uses them almost exclusively in dishes calling for mushrooms. “They have a taste reminiscent of baby portabellas. We obtain ours from a local grower.” he says. Even though things are slowing down to a crawl in the garden after the frost, fall can still be a very busy time of the year for the die-hard gardener. In addition to all of the garden and yard clean-up there’s still plenty of planting to do especially if you look forward to flowers in the early spring. The only way to get Tulips and other spring flowering bulbs to bloom in your garden is to plant them right now. Although the choice may be more limited than earlier in the fall, plenty of bulbs are still available in garden centers. Back when I was gardening professionally I needed to get my bulb order in by July first each year. A lot of planning went into deciding just how many of each variety would be planted and into which garden. So in July, during the busiest time of the regular growing season, I was compelled to come up with a plan about how the garden would look in April. Since I would plant between 15,000 and 20,000 bulbs a year, my order would be placed with other large orders of bulbs in the summer. Bulb growers in Holland needed to know ahead of time how many bulbs they would have to harvest and ship to the USA. Your local garden center probably placed their order at that time as well. The bulb planting season actually starts earlier in October. The idea is to get the bulbs into the ground so that they will have time to develop a good root system before winter. You can imagine that with 20,000 bulbs to plant I often was planting well into November and even sometimes into early December. Most gardeners don’t have that excuse and should get their planting done soon. Bulbs look best planted in clusters rather than in straight lines or as single plants. If you can afford it, large drifts of single varieties make an impressive sight in the spring. You don’t need to plant thousands of bulbs to make an impression, even a small planting near the house can be a real joy after a long winter. 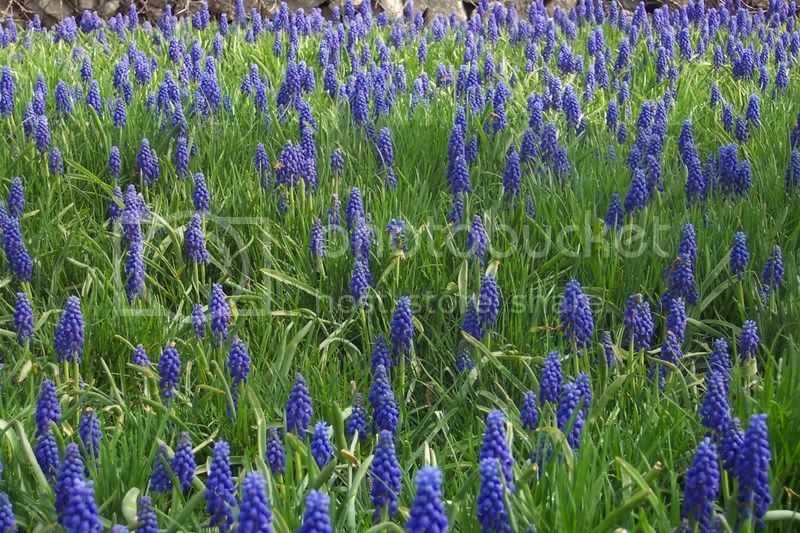 Eye-catching Drift of Grape Hyacinths. Crocus, Tulips, Daffodils and Hyacinths are the most common spring bulbs that are planted therefore are the most commonly available. Others you might find include Muscari, Anenomes, Snowdrops, Scilla, Allium and others. When buying your bulbs look for ones that are free from mold, discoloration or other signs of rot. Also a healthy bulb will feel heavier in your hand than one that has started to deteriorate. Larger sized bulbs such as Daffodils and Tulips are planted deeper into the ground than the small bulbs such as Crocus and Muscari. The small bulbs are planted into a hole that is about three inches deep, while the larger bulbs are planted twice that depth. Usually detailed planting information is available for each variety when you purchase your bulbs. Any fertile garden bed will support the growth and development of spring bulbs. If you never have planted bulbs before, to get you started I have scanned a leaflet from the US Department of Agriculture that describes how to plant bulbs. It contains more detail than I can present here in this blog. Take the time to plant some bulbs this fall then when spring rolls around you’ll be glad you did.